Disreputable Trader. Card Artwork. Monster Class: Human trader who "knows" what you're looking for and "has" the "right" stuff you need for your quests. During quests, young adventurers need to restock or obtain valuable equipment or items in order to survive the next battle, and for that we have merchants, vendors, or traders. However, there are many types of salesman, and there are of course, the shifty ones. The Disreputable Trader is a con artist of the highest caliber, using ungodly speech to conjule and swindle naive adventurers out of their hard -earned coins for items and trinkets that are of questionable make and value. You must take great heed in these words and be on the lookout for the signs of the Disreputable Trader. 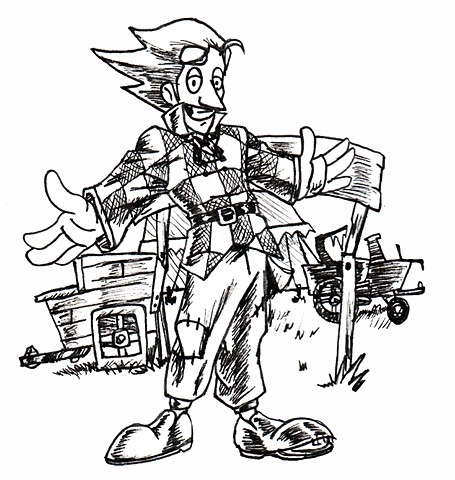 The Disreputable Trader is a character modelled after the stereotype of the Used Car Salesman, using any word trick in the book to con and confuse people into purchasing less than stellar vehicles, and mix that with defunct carriages and ineffectual weapons, and you got yourself a Disreputable Trader.